There’s a fantastic discussion going on in the JNC forums right now about J-tin appearances in anime. We never knew there were so many animated nostalgics and are blown away by what readers have uncovered. 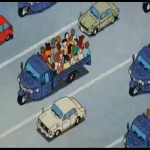 One of the hidden gems has been JT191’s choice of Crayon Shin-Chan: The Adult Empire Strikes Back. 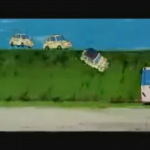 Not only does it have a massive car chase, but heaps of references to kyusha culture. And thanks to that, we have a new JNC Contest below. Basically, Crayon Shin-Chan is a long-running anime and manga series about a foul-mouthed kid who gets into all sorts of trouble. In Adult Empire, a megalomaniac yearns to return Japan to the halcyon post-war days of the 20th century. He brainwashes the country’s adults into behaving like children, leaving the real kids like Shin-chan and his friends to fend for themselves. 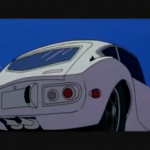 The amazing thing is, the movie is peppered with references to 60s and 70s Japan, with the 1970 Osaka World’s Fair, old TV shows like Ultraman and — of course — old school cars playing a huge part in the nostalgia. Whoever wrote this really knew their stuff. 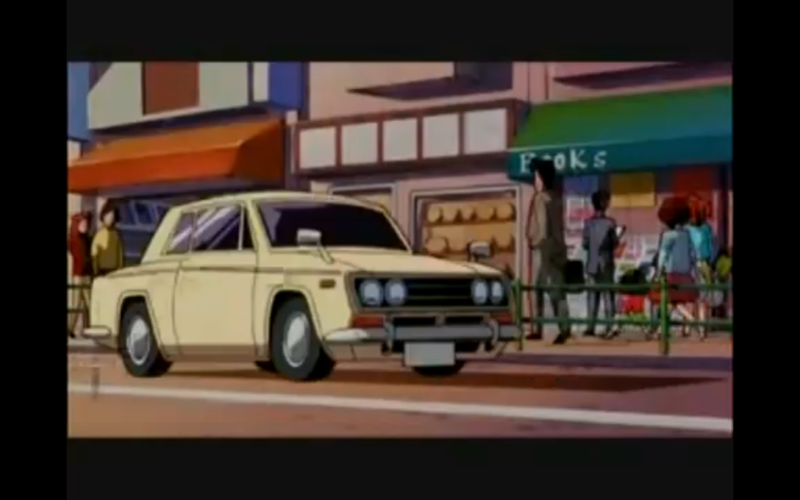 For example, at 15:44 in Part 2, the music that plays is the familiar sound of Seibu Keisatsu‘s main theme. 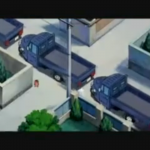 For example, when the mastermind comes to round up the adults, he employs a fleet of Daihatsu CO10T 3-wheeler trucks. 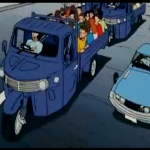 Later, Shin-chan leads the bad guys on a huge car chase involving a school bus, the villain’s beloved Toyota 2000GT and about five hundred Subaru 360 kei cars. And as you can see, there are plenty of other nostalgics sprinkled throughout. Sadly, the creator of Crayon Shin-Chan, Yoshihito Usui, went missing on September 11, 2009 and was found dead at the base of a 1400-meter cliff a week ago. 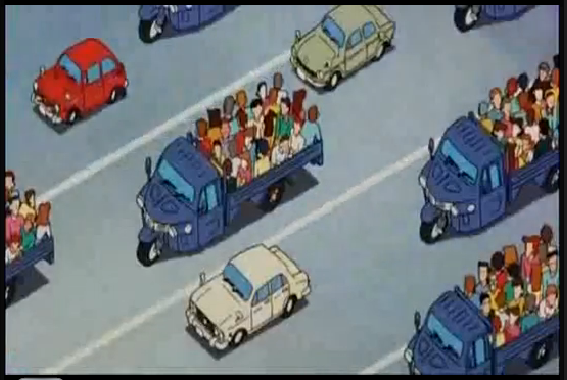 Our favorite part is when the parents are driving around, watching nostalgics pass by. 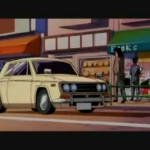 If anyone can identify the song used in this scene (15:48 of Part 1), we’ll send you one of those Hot Wheels Datsun 510s. Its usage is absolutely brilliant. Email your entries to the “feedback” addy at the bottom of this page by 11:59pm Pacific Time on Tuesday, October 6 with the subject line “CONTEST”. Watch the videos below. 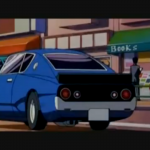 The car chase starts with Part 3.
tagged: c110 skyline, celica, co10t, contessa, corolla levin, corona, corona rt40, cosmo 110 sports, cosmo 110s, cosmo sports, crayon shin-chan, crayon shin-chan: the adult empire strikes back, daihatsu, hino, kenmeri, kgc110, mazda, midget, rx-7, sa22c, seibu keisatsu, skyline, sprinter trueno, subaru, subaru 360, te27, toyota, toyota 2000gt, Yoshihito Usui. 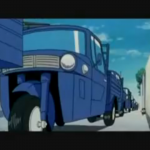 FLCL had a Daihatsu Midget, and an unknown station wagon (seen in the “Manga Dinner Scenes” before Nanao walks down the stairs and into the dining room). 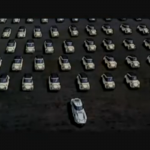 Also, Internet Movie Car Database. 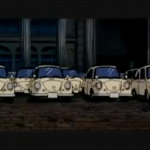 Theirs a page for Detective Conan, Lucky Star, and You’re Under Arrest: the Movie. 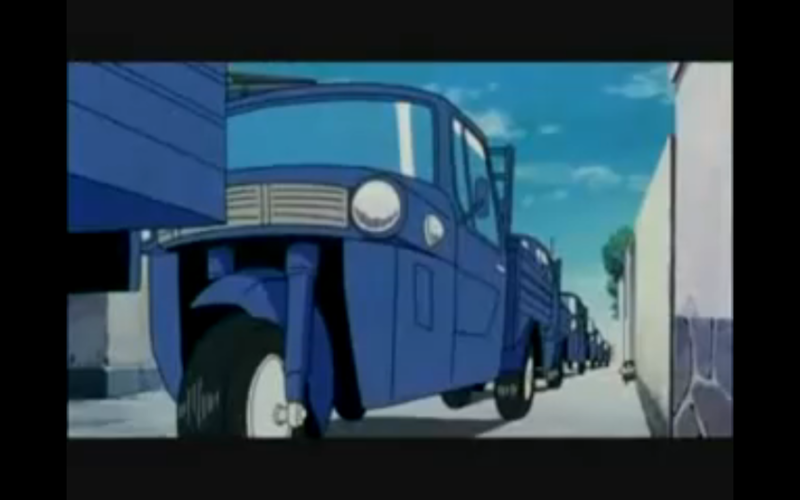 Whoops, FLCL had a Daihatsu CO8. Not the Midget. 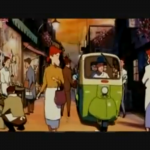 The presentation (animatography) looks nostalgic too. 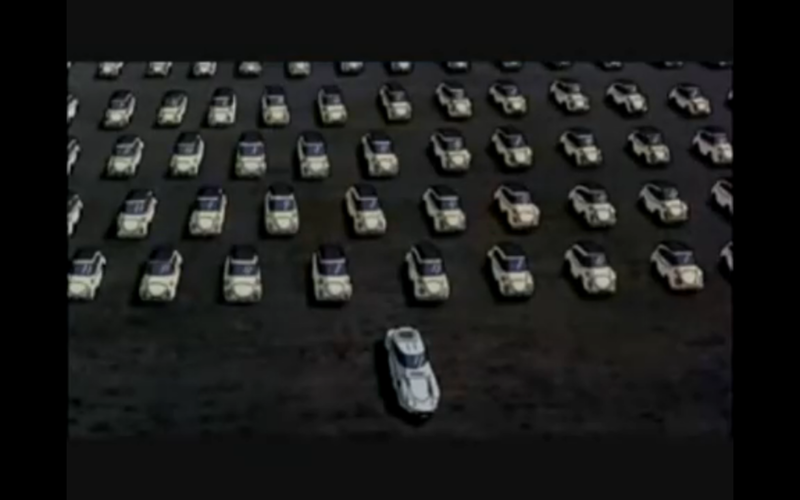 I can hear the Speed Racer car chase accompaniment music in my mind when I look at the last screen shot with the three wheel trucks and other cars four wide on a striped highway. Went missing and then was found dead huh! 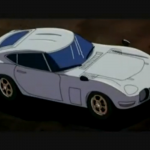 Is this animated series more than a cartoon!? The mountian, at the bottom of which police found Yoshihito Usui, was actually 1422 meters, not feet. That’s 4600 and some-odd feet. Long way down…. 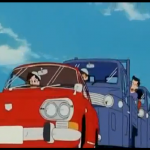 That red car without a grill, is that a Hino Contessa? I read the news last week and thought it was a great loss! He was a very very very good artist and, just like this episode, always spot on! Thats great that he fell 1422 meters! But the question still remains, why did he go missing, and why was he at the bottom of some huge cliff!? Oooooh! I knew the song the moment I heard it. No! 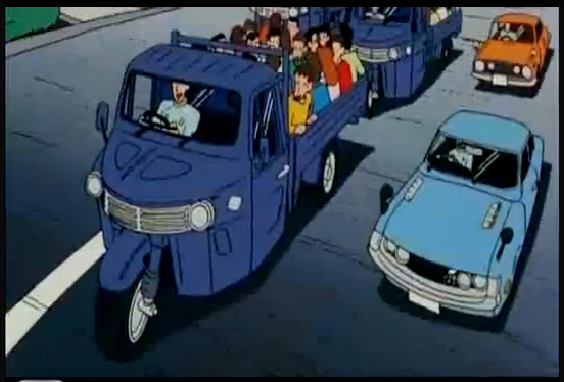 Shin Chan! bad, bad, bad Shin Chan!!!! 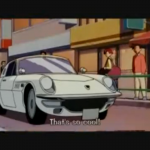 Don’t pee on daddy’s 2000GT!!!!!! That was hillarious and um………..disturbing! Well it took me half the wekend but I finally saw the whole thing, and I must say……….yeah, uhh, I have no words! 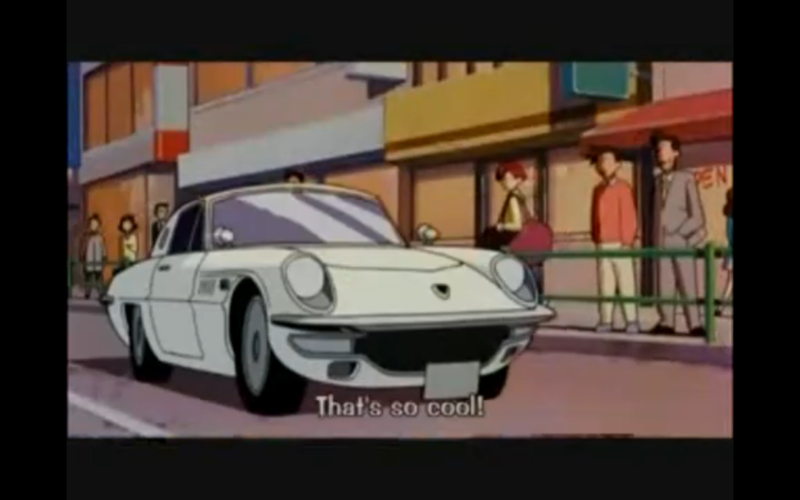 I’d love to live in a town in which everyone drove vintage Japanese metal.